I tried really hard to get veal shanks that originated somewhere around here. This recipe calls for a whole shank, 3 to 4 pounds. I didn't expect to find those at a supermarket, and we don't really have real butchers around here, so I started out with two specialty purveyors I know. Both could get cut shanks. Neither could get whole. I called a couple of ranches between here and Ocala. Most of them didn't deal in veal. One of them told me that their veal didn't have legs. Which, I mean, I've heard horror stories about veal, but I've never heard that. Then one day I was in Whole Foods for something else, and figured I'd ask. "Yeah, of course we have that. We cut them ourselves, but you can buy it whole if you want." Whole Foods gets their veal from a consortium of ranchers in Wisconsin, so, so much for a local cow, but at that point I was committed. I read the mission statement of the consortium, and it said they are pastured, raised on mother's milk, antibiotic and hormone free. The calves, I mean. Not the consortium. Anyway, since I was making this for eight, I got extra shanks, and that made this the most expensive dish in the book so far. Until I get to the stuff with truffles. Then all bets are off. The dish was pretty easy. It started by putting the shanks in the biggest roasting pan that will fit in my oven. Then I browned the shanks on the cooktop. Since I used a big roaster, I had to do it over two burners. 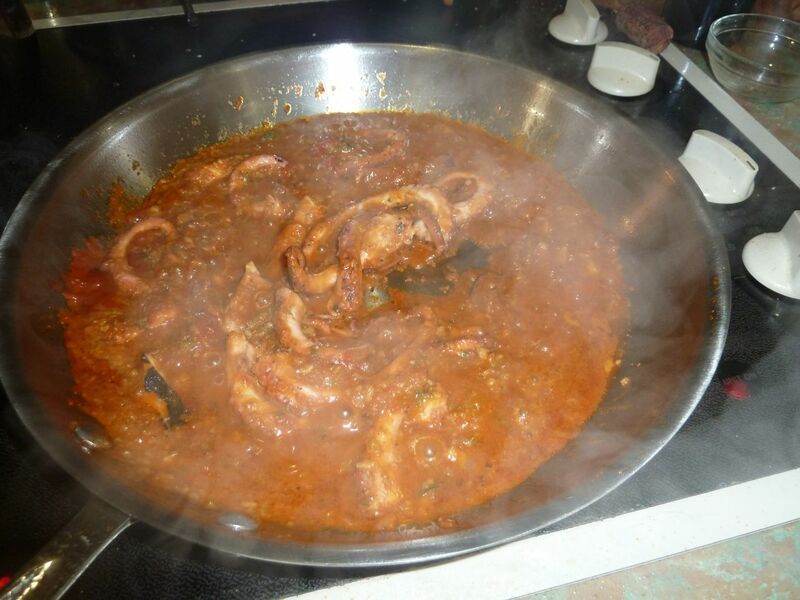 Then added wine, stock and tomato sauce. Then put it in the oven and forgot about it for a couple of hours while I made everything else for the dinner. At the last minute, made the gremolata to go over it. The photo at the top of the post is as it was taken to the table. Yes, a little sloppy again. I wasn't so much styling that night. 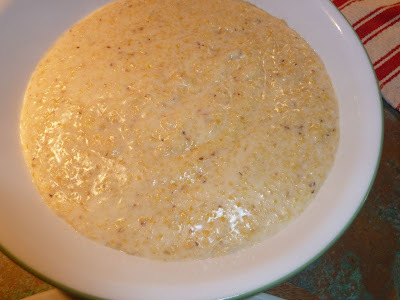 Polenta: Too easy to get its own post. I made it to the recipe. Sort of. I substituted grits for polenta. I buy stone-ground organic grits whenever we go to South Carolina. I love polenta, but I'll take these grits every time. Every. Time. 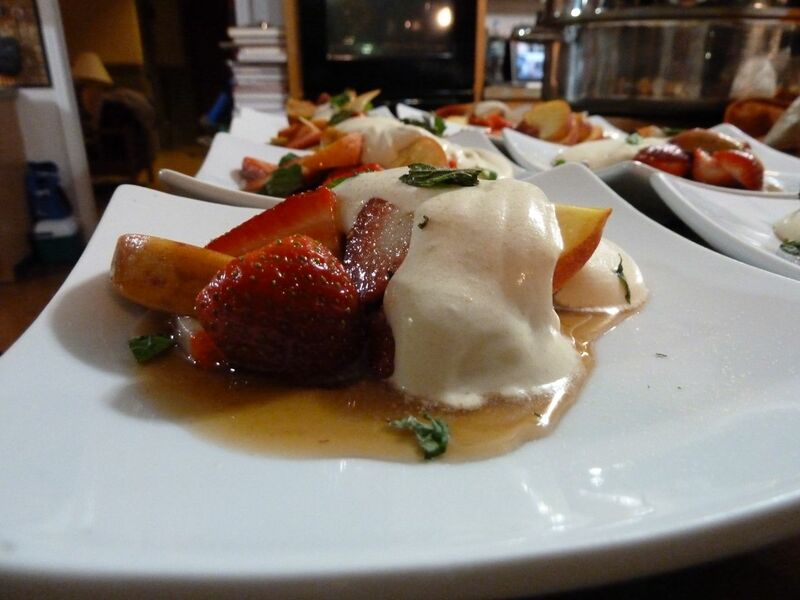 The only other ingredients are water and mascarpone. I used those as directed. 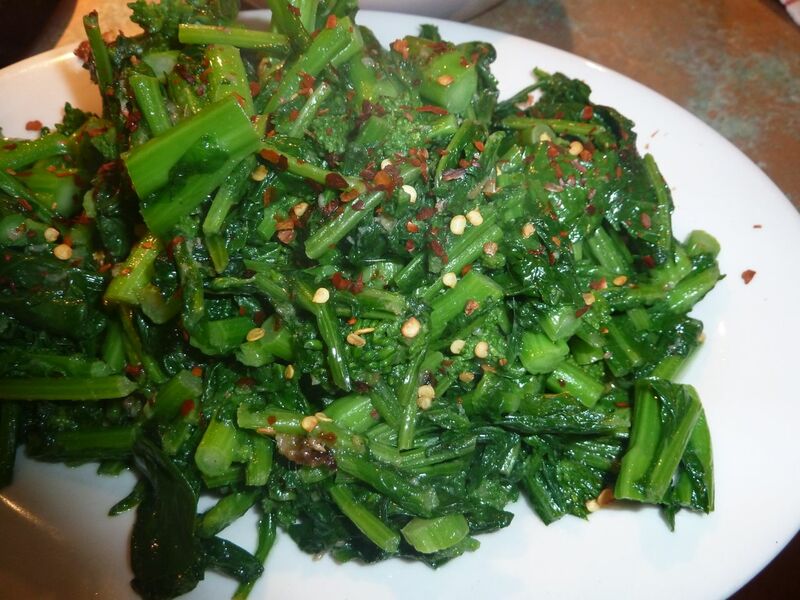 And broccoli rabe: Boiled and shocked, then sauteed with some anchovy. Just fine. I have to say, going with the whole shanks is really cool. 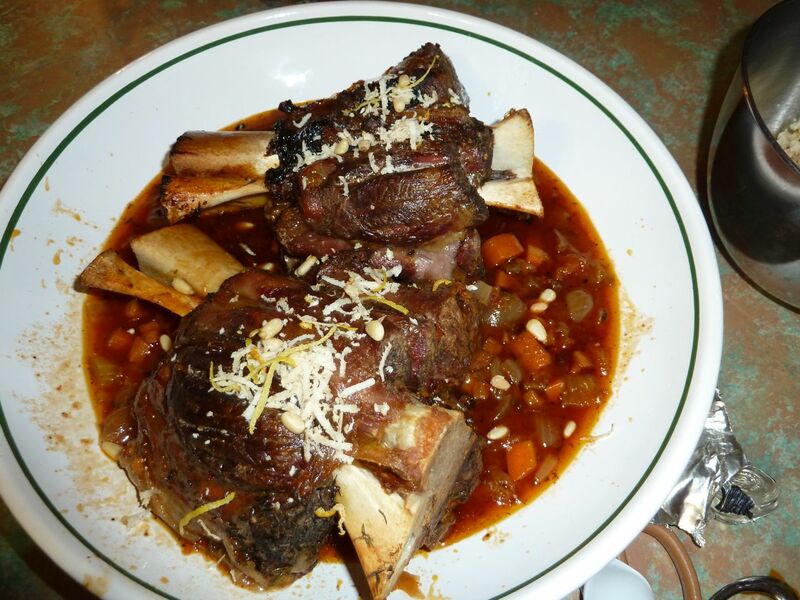 The cut shanks are nice for individual presentation, but the whole shanks, served family style, was pretty primal. 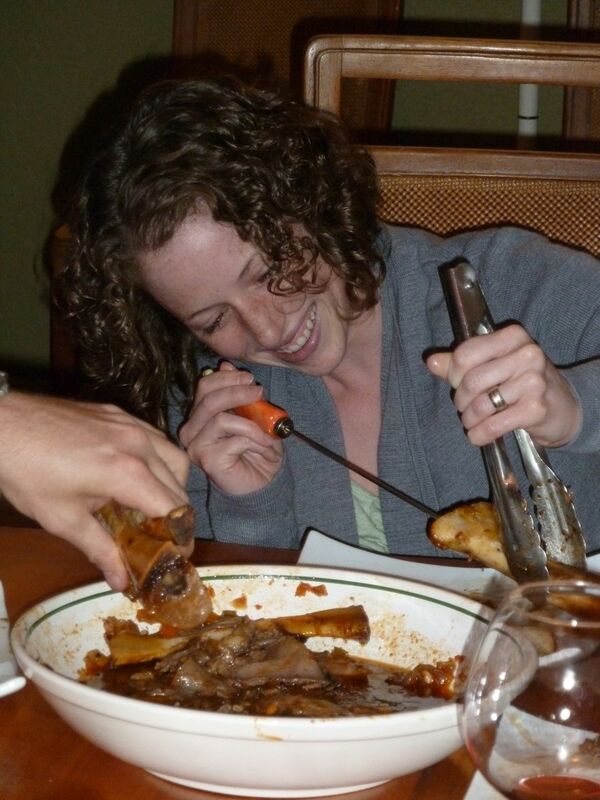 Especially when everyone started looking for tools to use to extract marrow. 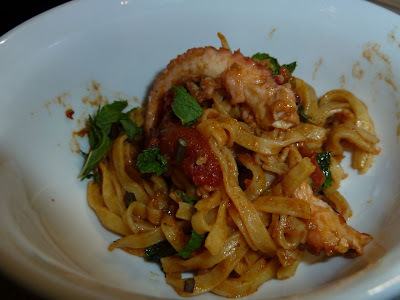 Well, except for the octopus and the pasta, getting everything for this dish was easy. The octopus was sort of easy. Almost. This dish calls for a pound of baby octopus. 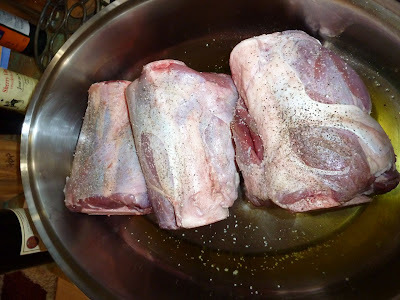 I was doubling the recipe for a dinner party, so I needed two pounds. I went to IC Sharks and saw that they had baby octopus right in the case. I told the lady that I needed two pounds, and she pointed me to the freezer case, because they didn't have two pounds thawed. Not a problem, it'll thaw fast, and it wasn't like any octopus I was going to buy hadn't been in the deep freeze at some point, anyway. So I go to the freezer and grab two plastic bags, each purportedly holding one pound of baby octopus. 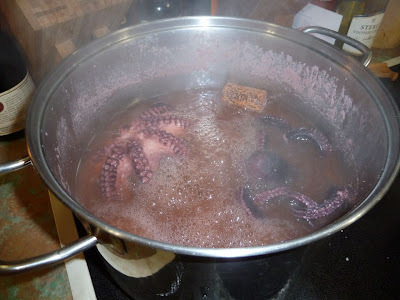 It was just a big ball of purple at that point, so there was no reason to presume that there weren't several teeny octopi in there, waiting to be thawed. When I got home, I put them in some water to thaw them quickly. The more they thawed, the more I realized one thing: There was only one octopus in each bag. And I can't believe I didn't take a photo of the thawed octopus. The recipe had a contingency for a larger octopus, so I dealt with it, but I was sort of disappointed. The photo in the book looks really cool with the little octopus on top of the pasta. Sigh. I looked a lot of places and couldn't find any stinking bavette. The descriptions made it sound like it was basically linguine, possibly a bit thinner. If I had had more time, I would have made my own linguine, possibly a little thinner, but I had no time. So I stopped in at Mazzaro's and bought some fresh linguine. Sigh II. 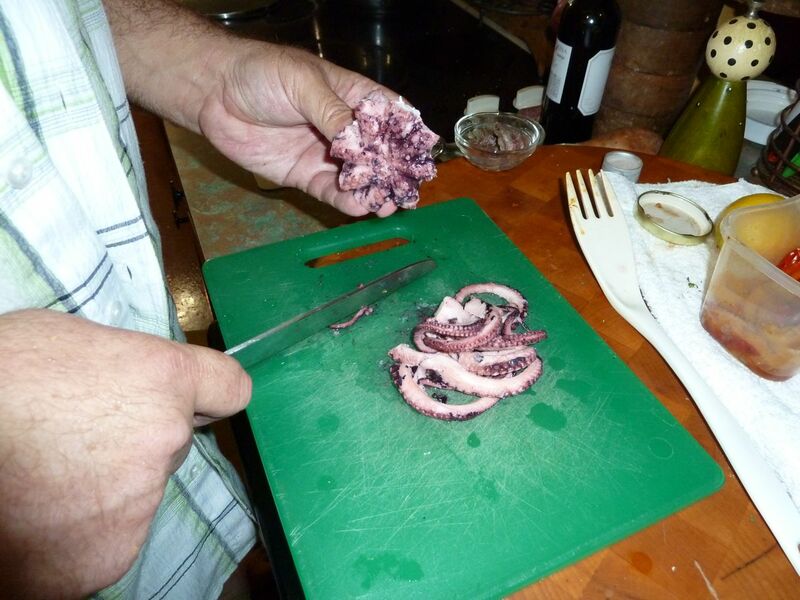 Cooking the bigger octo meant cooking it a little longer. The recipe calls for it to be boiled in water with a little vinegar and a wine cork (something about enzymes). 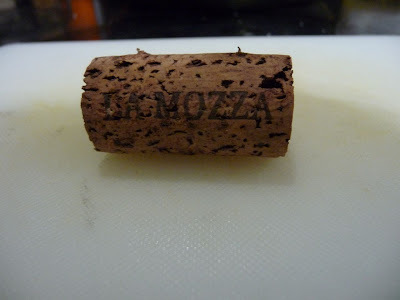 I used a cork from a bottle of 2008 La Mozza, but I'm sure that any cork would suffice. The sauce went together with basic tomato sauce and jalapeno pesto. This was my first time making octopus, and since I was a little off the reservation in terms of the recipe, I wasn't sure how to cut it for serving. 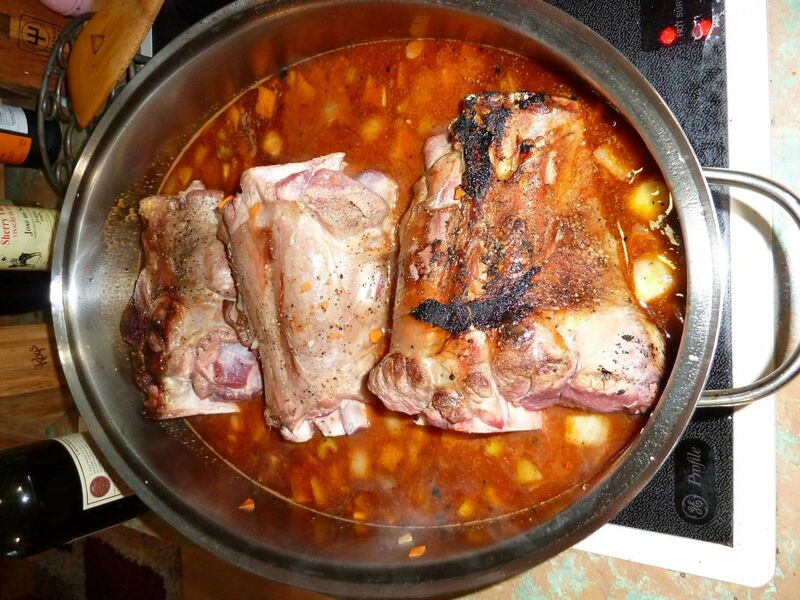 I knew you can eat the legs, so I cut those off and threw them in the pan. I wasn't as sure about the body. I felt like I've heard there is something you have to take off, and I had no time to research, and no one knew. So we just at the legs. And they were delicious. The whole dish was. Truthfully, the two octopus dishes in the book were things that I was planning on just sort of getting through, but I liked this a lot. Enough that I might try to make it again. With baby octopus. And bavette. Here is the final dish. I didn't lead with this photo because the plate is a little sloppy. This was a middle course of a big night, and i must have gotten sloppy. That and I was disappointed that I couldn't replicate the photo in the book because I didn't have baby octopi. Sigh III. 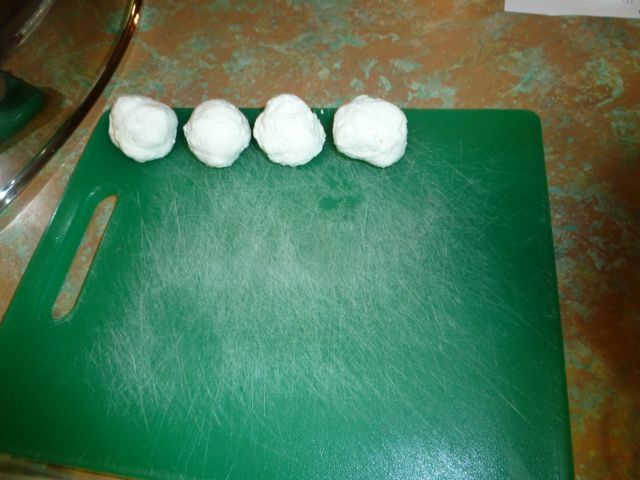 So, I did decide to make my own goat cheese. It is way easier that making prosciutto. The recipe calls for goat cheese from the store, and specifies a preference for Coach Farm. I found Coach Farm goat cheese at a store in Miami. But they only had little things that were like 2 ounces. The recipe called for 2 cups, and I was planning to double the recipe. And that 2 ounce package was like $11. A little quick math, and I figured that 4 cups was going to cost, like, a bajillion dollars, and that was assuming the even HAD that much back in the safe, or where ever they were keeping quantities more than 2 ounces. Plus, I didn't marry into the Coach Farm family, so I sought options. There is a woman that sells goat cheese at the Saturday Morning Market. She makes it from milk she gets from her very own goats. My initial plan was to get the cheese from her, because that sounded cool. 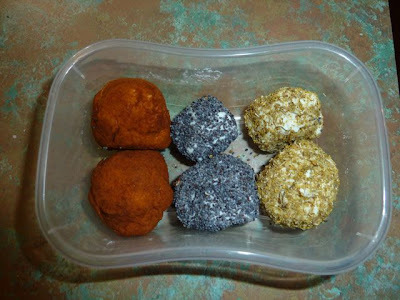 But she told me her goats weren't giving her enough milk to make cheese for now, and she told me why, and it had to do with bodily processes that I totally know are related to milk and everything, but sometimes just don't want to think about them relative to beautiful goat cheese truffles. I can be like that. So I went to Whole Foods and bought goat milk. 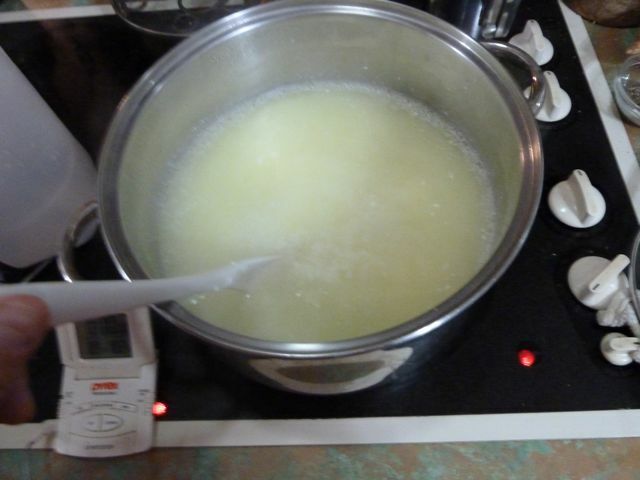 I read instructions on making goat cheese on the Internet, and it all seemed pretty simple: you heat milk to somewhere between 180 and 185 degrees, add some lemon juice, stir and strain. 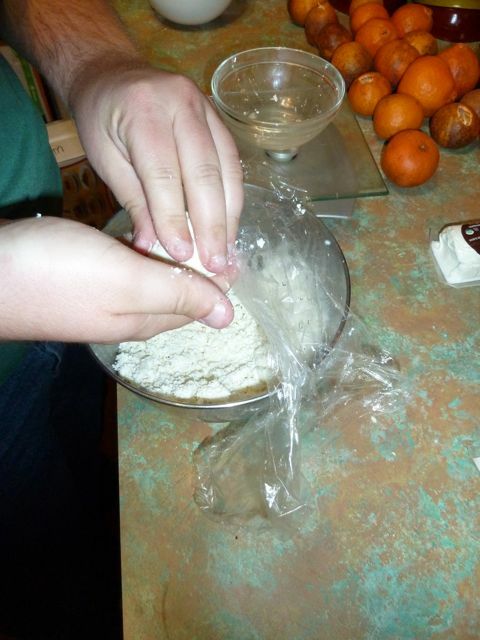 The thing I couldn't find in any Internet-based recipe was the yield. 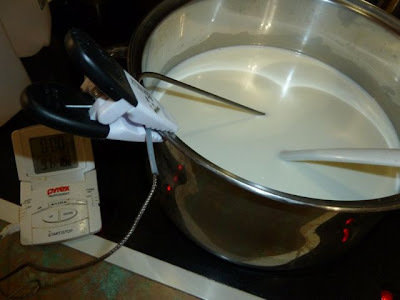 Literally, the recipe would say, "Heat a quart of milk. Add 2 tablespoons of lemon juice. Stir. Strain. You have cheese." "HOW MUCH!?!?!?!?!?" I would yell at the Internet. But it never answered. So I bought a gallon of goat milk and hoped for the best. 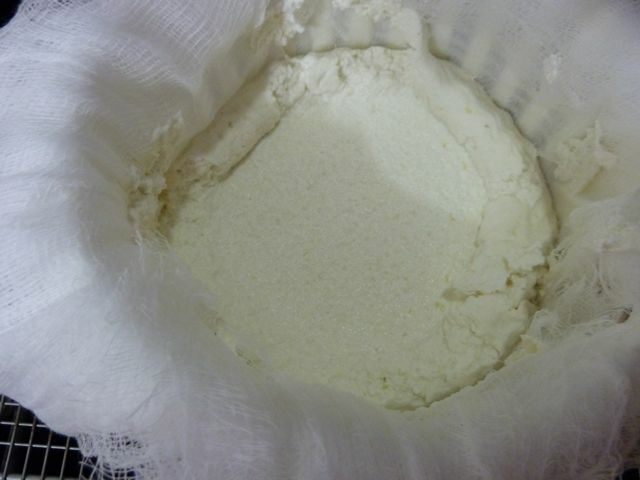 Dear Internet, the yield on one gallon of goat milk is roughly 3 cups of goat cheese. I tasted it the next morning. It was fine, but not great. Kind of bland. I added more lemon juice and some salt, and suddenly it tasted a lot like goat cheese. I think if i had let it set a few days, it might have developed more flavor on its own. So I sort of cheated. The cheese balls are rolled in different coatings to make them all pretty and tasty. The first is poppy seeds. I had those already. The second is pimenton (Spanish paprika). I had that already. And the third is fennel pollen, which is a cool ingredient that I had been searching for for years without finding it nor knowing what i would do with it if i did. But last October, I was in Napa, Calif., and went to the Oxbow Market. There was a spice shop there, and they had fennel pollen. I bought about $5 worth, which, when measured out, is visible, but just barely. I had no idea what I was going to use it for at the time. But now, I needed fennel pollen. And I had it. I can't believe i did not shoot video of the rolling process. it was SO exciting. 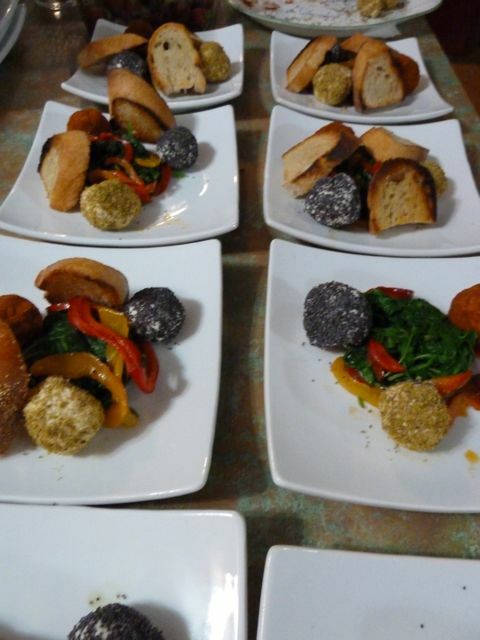 The plate goes together with some blanched arugula and bell pepper tossed in sherry vinegar. Then each truffle gets a little round of toast (MORE TOASTING!). In the photo in the book, the toast rounds are standing up on end in a really cool composition with the truffles. I couldn't make that happen. So mine looked exactly like they do in the picture here. Because, well, this was them. Postscript: one of the reasons I wanted to make my own goat cheese was because I figured it would be cheaper. I crunched the numbers, and it really wasn't. I probably would have paid about the same for that amount of goat cheese as I did for the gallon of goat milk at Whole Foods. Now, I have seen Internet ads for local goat farmers who sell milk for about half the price i paid at Whole Foods. But for this night, I didn't have time to track them down. Maybe I will and I'll try it again and see if it makes for better cheese. I decided not to make my own prosciutto San Daniele. For a lot of reasons, really. First of all, it takes like two years. Who has that kind of time? In two years, I hope to have someone cooking through MY cookbook. OK, so, not really, but it's a long time. Second, there is probably some specific kind of pig required. One that has a purple halo around its right ear in fall, or shoots glitter out of its tail. 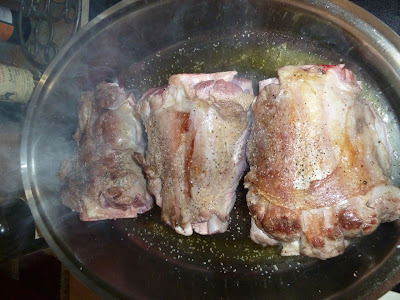 I could probably get a decent pig leg, but who knows? Third, I'm not in Friuli, and that's where they make San Daniele. Location, location, location. What are those pigs eating? And I don't have an old barn to hang a pig leg in just they right atmospheric conditions. I read one time that Mario had imported a barrel of Friulian dirt and put it in a basement where he was making sausage. The thinking was, according to the story, having the northern Italian dirt would season the air. I have no idea how that worked out. But for my purposes, I just went down to Mazzaro's and asked for a half-pound of it, then made my way home. The recipe also calls for winesap apples. Never seen them before. I thought it might be because I never looked. So I looked, but still didn't find any. Apparently they grow in Virginia and have a fairly short season in fall. Purple halos and sparkles may be involved. So there's a good chance I have never seen them. The research I did suggested that they were sweet and tart with a slight hint of wine flavor. Thus the name, I guess. So I took equal parts Granny Smith (tart) and Fuji (my favorite, and sweet), and sliced them and, since the recipe called for the apples to be cooked anyway, I cooked them in a little wine. That resulted in apples that tasted a lot like what I read winesap's should taste like. I was also supposed to find black mustard seeds for this. After going to every store I know that might sell mustard seeds of any ethnicity, I could find none. 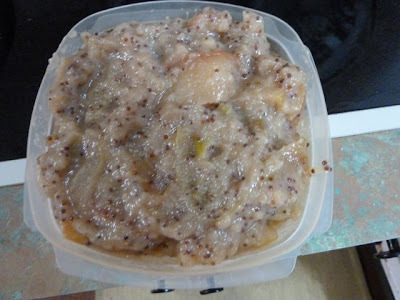 So I went to the Internet and found that black mustard seeds and brown mustard seeds may very well be the same thing. Every store I went to had brown mustard seeds. So I got them at the store that I happened to be in when I discovered that they were both the same thing. Also, gas costs like $3.50 a gallon. Just seemed a relevant time to mention that. I made this to be the passed appetizer at a dinner party for 10. I made the marmellata. 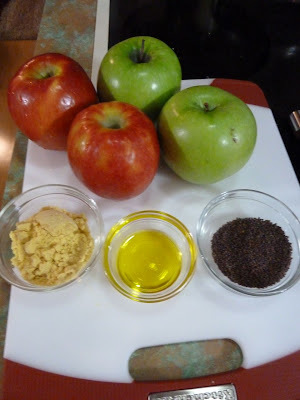 Which is cooking down apples a little, then adding dry mustard and mustard seeds. My instinct told me to peel the apples, but the recipe did not tell me to. So I didn't. I sort of wish I had, because the mixture was really nice and I thought the peels detracted from the texture a little. Shrug. It doesn't look pretty, but it was delicious. Sweet and hot. Other than that, all that was left was toasting bread and assembly. I say "toasting bread" like its easy, but the truth is, around here it's sort of a feat. 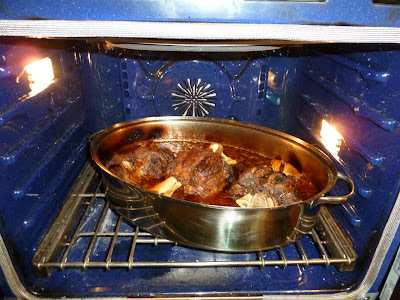 We toast under the broiler, and the broiler in our oven is kind of schitzo. Its the only oven I've ever seen that won't let you broil with the door open. And when I broil with the door closed, fire often ensues. But we survived. The recipe describes a plated presentation, but the photo in the book makes it look sort of like a bruschetta thing, and that fit my plan better, so we did that. 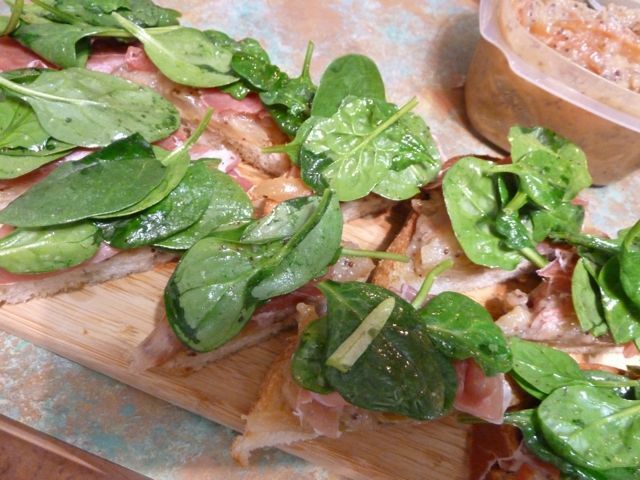 Spread a little apple-mustard on the toast, top with a slice of ham and some spinach, and you are declared a genius.